Jim McTevia's latest book inspires, informs, and even entertains while frankly and nimbly recounting how the author — renowned as a problem-solver in the business world — has confronted one problem that cannot be solved. McTevia's unexpected foe is a rare, incurable disease. McTevia has made his peace with inclusion body myositis — known as IBM to its victims — and in fact has not slowed a step in his busy consulting practice and nationwide slate of board memberships. He plans to be full-bore on the consultant scene for years to come. "Retirement," he says, "is something I've given less thought than...well, almost anything I can think of." But he wryly sums up human nature in the chapter heading: "I'd Rather Not Have Inclusion Body Myositis." His philosophy translates to credible, well-spun advice for readers facing any adversity — medical, financial, or spiritual. 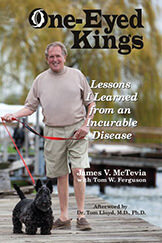 One-Eyed Kings: Lessons I Learned from an Incurable Disease is a riveting reminder of perils lurking for all of us in every arena, and the inner will we must harness to address them. McTevia's unusual career illustrates, with captivating irony, the parallel tracks on which human nature leads us toward denying bad news of any kind. The business and the personal become a metaphorical framework by which the reader understands McTevia's obscure disease, and how he regards it as "an irritant." Among McTevia's own inspirations in life, well-discussed in the book, are voices as diverse as a favorite rock star, a psychiatrist friend who was a best-selling author, a California priest he has never met but whose homilies are a weekly treat on iTunes...and the author's imaginary PHD from, as he puts it, the School of Important Things You Cannot Learn from Anywhere Else (but on the street). As the foremost pioneer of what has become a growth industry in America – turnaround management and the liquidation of failed companies – James V. McTevia knows all too well whereof he speaks – he has seen the ravages of debt addiction in every form, from every angle. McTevia has turned around scores of businesses in North America with sound financial strategies that minimized pain and losses. But for every successful turnaround, McTevia has had to give hundreds of people the news that their jobs are gone and had to tell owners their once-thriving business is defunct. Regrettably, as a liquidator of failed companies, McTevia presides over one of the few thriving industries in a deeply troubled economy. In plain, straight talk, McTevia analyzes how and why America got itself into such fiscal peril – and what it must do to regain the fu¬ture for its grandchildren. 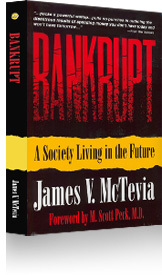 James V. McTevia has seen the ravages of debt addiction in every form, from every angle. As a kid pushing a lawn mower to pay off his own impetuous debts. As a repo man, a bank loan officer, and a pioneer of the field of turnaround management. Finally as a nationally renowned business and management authority, James V. McTevia has dissected and dealt with the devastating consequences of crushing debt. He knows first-hand the toll that irrational, excessive debt takes on people, institutions, and society. 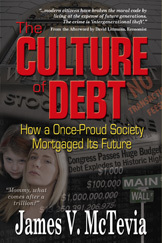 In this all-too-prophetic book, McTevia offers an expert but common sense analysis of unrealistic debt. Everyone who reads this book will see the consequences of personal, corporate and government indebtedness, the ultimate price tag for spending the wealth of future generations today.